Blast, Corrupt, Dismantle, Erase…Frack, Gene-splice, Hinder, Immolate…We all have dystopias to write. 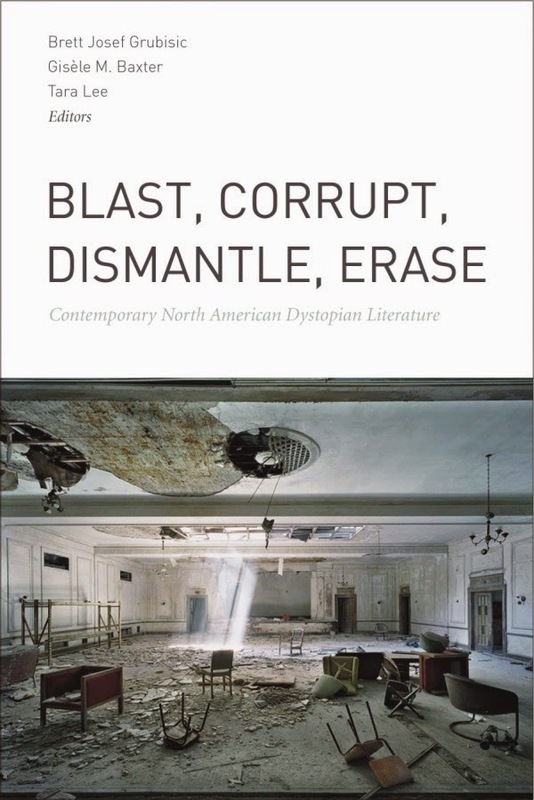 With an introduction and twenty-five separate essays, Blast, Corrupt, Dismantle, Erase covers impressive ground. The book comes to terms with a genre that appears to be, if anything, broadly conceived: while the sheer length of the project suggests that it might have benefited from editorial discretion, the ethos of dystopia lends itself to varied applications and interpretations. Indeed, the rewards of engaging the text as a whole are great, especially as some of the strongest work is found in its latter half.The collection, when read in sequence, does not allow one to settle in to a particular geography, national-economic space, or version of dystopia; instead, the arrangement of the chapters jumps, for instance, from alter-histories of women in the Mexican Revolution, to the deeply troubled Montreal of the mid-nineties, to Douglas Coupland’s slacker realism. The effect produced is one of cycling defamiliarization, a shuffling of imagined destinies and short-circuited hopes that comprise a dauntingly heterogeneous futurity. These vertiginous snap between futures subtends, but does not override, the critical intervention of the book: to shift contemporary studies of dystopia from an Anglo-American or loosely international frame to one that understands the dystopian literary mode, and the texts specifically produced, in the wake of the cultural changes that have taken place in North America since the North American Free Trade Agreement (nafta). In this collection, held separate from its literary tradition, dystopia becomes a critical tool that assesses the unevenness of the North American political economy. Indeed, the dizziness of considering, in turn, Nalo Hopkinson’s hollowed Toronto, Alex Rivera’s sleep factories, and Neil Gaiman’s dystopian phantasmagoria emulates the free flow of goods across Canadian, U.S., Mexican, and the ever-obfuscated Indigenous borders of the continent. From the start, I noticed a typical formal split in the author’s approaches to dystopia. On the one hand, some seem to refuse to assume the kind of shared intimacy with their object literary critics so often accept as a part of their endeavour. This variety of essay in the collection relies heavily on quotation, communicating as much as possible of the dystopia in question in its own words, be it Cormac McCarthy’s futureless future or Lisa Robertson’s critique of a gentrified Vancouver. I like this approach particularly in “‘The Dystopia of the Obsolete’: Lisa Robertson’s Vancouver and the Poetics of Nostalgia,” Paul Stephens’s essay on Robertson’s The Office for Soft Architecture (2003), precisely because he seemed able to remain true to her poetics and her politics through his citational practice. On the other hand, Sharlee Reimer insists on the critical project of interpretation championed by Larissa Lai’s Salt Fish Girl (2002) in “Logical Gaps and Capitalist Seduction in Larissa Lai’s Salt Fish Girl”; Sharon DeGraw places Hopkinson’s Brown Girl in the Ring (1998) against Detroit’s deterioration to highlight the green urban policy of the novel; while Robert T. Tally Jr. comes closest to naming the obfuscated futurity of the global hegemon through Gaiman’s American Gods (2001) in “Lost in Grand Central: Dystopia and Transgression in Neil Gaiman’s American Gods.” The essays that work through their texts, rather than alongside them, seem to extend the critical work of the dystopia in a shared world-building with their authors, developing their work, riffing on Jameson’s description of the dystopia as “near future novel,” into a near future criticism. Although the 1993 ratification of the North American Free Trade agreement liberalized trade, it did not liberalize history, as the essays on Central American dystopias bear out. These six essays, focusing explicitly on Mexican, Chicano/a novels and film stand out for their strongly unified generic theory of dystopia. In “Archive Failure? Cielos de la tierra’s Historical Dystopia,” Zac Zimmer assesses that “as Americans, North, Central, and South, we live in a series of superimposed afters: after the conquest; after colonialism; after independence; after this revolution; after that revolution; after this war; after that war. Perhaps, one day, there will indeed be an ‘after globalization,’ an ‘after neoliberalism,’ an ‘after nafta’” (233). Thinking about the histories and present of settler-colonialism María Odette Canivell similarly posits that “when speaking about the Latina American utopian imaginary, two clearly defined camps emerge: utopias for Latin America and utopias of Latin America” (240). Further, Adam Spires argues that Homero Ardjis’s novels are “informed by Aztec history” and that they “remind us that, like the laws of nature, mythological time is cyclical not linear, and that indigenous legacy of mythology is inextricable from Mexico’s future” (352). Finally, Luis Gómez Romero describes Latin America in Borgesesque terms as “a historical labyrinth erected upon antique and new stories of oppression and inequality that seem to stretch from the sixteenth century right into the twenty-first” (373). What Zimmer, Canivell, Spires, and Romero collectively uncover is the radical critical quality of the Latin American dystopia and the penchant for such texts to outdo their U.S. counterparts, even those as developed as Gaiman’s, in their mobilization of history. One overwhelming result of this collection’s purview is the revelation of how the centre seems determined-yet-unable to represent its own decline. While this observation does little to address post-nafta unevenness, it does address the kinds of diagnosis that help to depict the system behind such liberalizing agreements themselves, reminding me of the very real dystopian settler-colonial petro-capitalist hetero-patriarchy that we live in today. Several chapters are worth mentioning outside of my interpretative synthesis: Janine Tobeck on William Gibson’s Bigend trilogy; Richard Gooding on the ya dystopian novel Feed; Annette Lapointe on eating and eating disorders in Atwood’s Maddadam trilogy; and Lee Skallerup Bassette on Canada and Quebec’s cultural responses to nafta. Whether for teaching or research, I anticipate this collection will prove an invaluable reference, opening up new pathways and connections for those well versed in science fiction’s dystopian variants as well as for those newly embarking down the pathways of the future. Acknowledgements: I would like to thank Cecily Devereux for the opportunity to review this book and to Alexandra Carruthers and Adam Carlson for their editorial suggestions. This review first appeared in English Studies in Canada 40.2-3: Brett Josef Grubisic, Gisèle M. Baxter, and Tara Lee, eds. Blast, Corrupt, Dismantle, Erase: Contemporary North American Dystopian Literature. Waterloo: Wilfred Laurier UP, 2014. 480 pp.